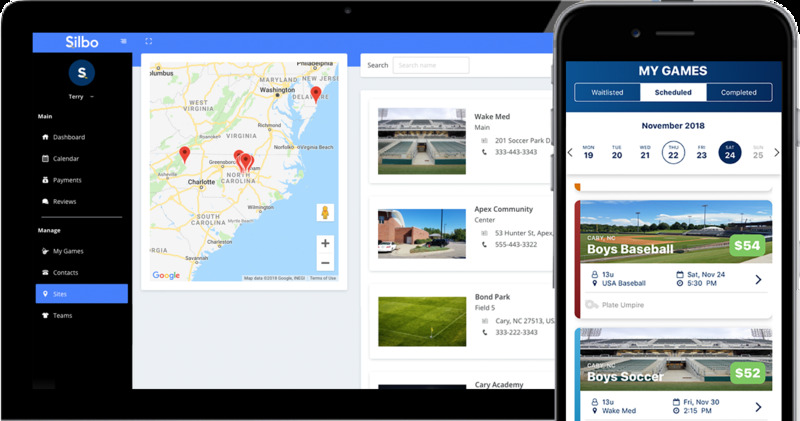 RALEIGH, N.C. -- Silbo, Inc., the leading automation platform for sports officials and amateur sports leagues, was honored as the "Most Promising" startup at the annual Triangle Tweener Awards. Presented by Scot Wingo, CEO of Spiffy and founder of Channel Advisor, the Tweener Awards are given to tech startups in the Raleigh-Durham area. Past Tweeners include Red Hat, SAS Software and Dude Solutions. Other companies receiving awards that evening included Durham-based sport tech venture TeamWorks. Brendan Szulik, Silbo CEO, accepted the award on behalf of the company. "It's rare that sports officials receive awards. Usually we just get boos," he said. "But receiving this recognition from Scot and our peers not only validates our business, but also our successful and continued advocacy for sports officials." The award follows Silbo's $1.3MM fundraising event in October and integrations with SportsEngine, TeamSnap and eTrak in November. About Silbo, Inc.: Based in Raleigh, NC, Silbo™ is the trusted provider of the leading sports officiating marketplace, Go Silbo™, connecting amateur sports games with qualified sports officials. Silbo's mission is to improve the amateur athletics experience by enabling sports officials and game providers with a simple and convenient way to assist the community of sporting officials to book games, work as much as they want and get paid for their services in a quick and timely way. The Go Silbo app can be found on the App Store and Google Play.